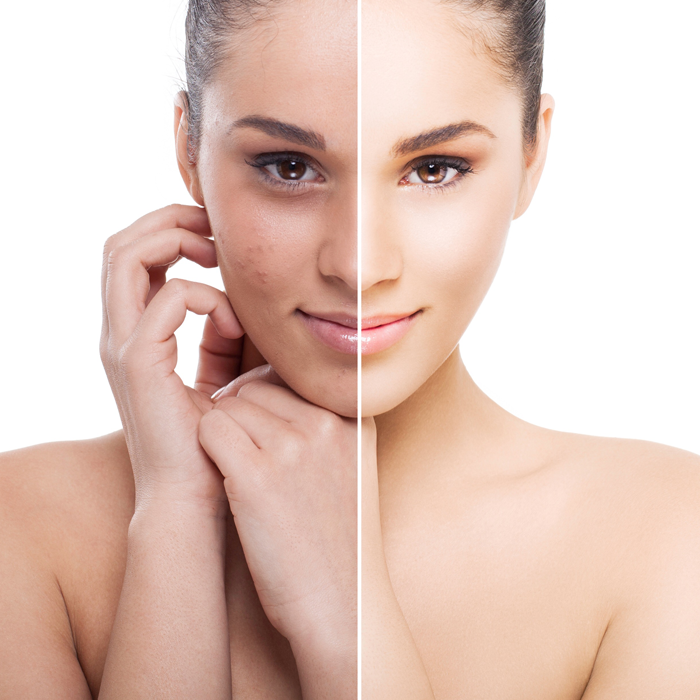 A chemical peel is used to improve surface skin tone and texture. An exfoliating formula is applied to the skin to lower PH, allowing connections between dead skin cells to loosen, inducing exfoliation and stimulating new cell growth. This process causes superficial layers of dead skin to slough off, revealing a smoother and more radiant complexion. Chemical peels can also thicken the epidermis, increase dermal volume and stimulate collagen production creating a bright and dewy glow to the skin. Chemical peels work by deeply exfoliating the surface layers of skin, forcing your body to quickly replenish it with healthy new cells. When peels are performed regularly, the skin becomes accustomed to this process and begins to rejuvenate itself like younger skin. We love this procedure as a stand alone skin treatment to help accelerate cell turnover or combined with other modalities such as Laser Rejuvenation to target specific skin concerns. We will often recommend Peels alternating with other skin treatments to help accelerate your results. Since flaking and peeling will begin usually 48-72 hours post-peel, we recommend scheduling your Peel for an evening mid-late work week so that the majority of your peeling will be done over your weekend. If you are prepping your skin before an event, give yourself 10-14 days prior to the event to allow time for your skin to slough away and renew. For regular skin maintenance, the frequency of peels will depend on the individual, skin type and concerns. We always customize your treatment plan to suit your schedule, proper timing will be arranged during your consultation. *note: Our Chemical Peels are customizable in strength and everyone peels slightly differently, so this is just a rough guide. We provide post-peel kits for you to care for your skin at home in the days following your Peel. Adhere to your post-peel instructions for the most effective and comfortable recovery. Your skin will look amazing the next day following a Chemical Peel - radiant and smooth. You can wear makeup as normal this day. Expect minor faking of the skin to begin around the mouth and jaw line. Makeup will be a little tricky today, go without if you can. Do not pick the skin! Peeling and flaking of the skin all over the face, will begin around mouth and travel out to the hair line. This may continue for the next 2-4 days. Continue using only the post-care provided by the clinic.